Why use PhotoReal Décor Glass? More and more products are adopting true-flat design concepts and the focus of this type of aesthetic is glass. By adding AMT PhotoReal décor glass to cover lens design, customers can enhance the overall value of their products. What defines PhotoReal Décor Glass? Current on the market, cover lens glass printing is predominantly performed using a silkscreen printing process. Silkscreen printing is performed in layers. If four colors are printed, that is an additional thickness of 4-5 layers of ink. More colors means greater ink thicknesses that can cause gaps and issues such as bubbling during lamination. In addition, silkscreen printing cannot precisely duplicate complicated gradients. The PhotoReal printing process can output at least 1 million colors at a thickness of <10um. Many of the sample panels you see displayed feature beautiful photorealistic pictures made possible only though AMT’s proprietary PhotoReal printing process. How reliable is PhotoReal Décor Glass? The PhotoReal printing process creates a layer of ink that is incredibly thin yet adheres remarkably well. 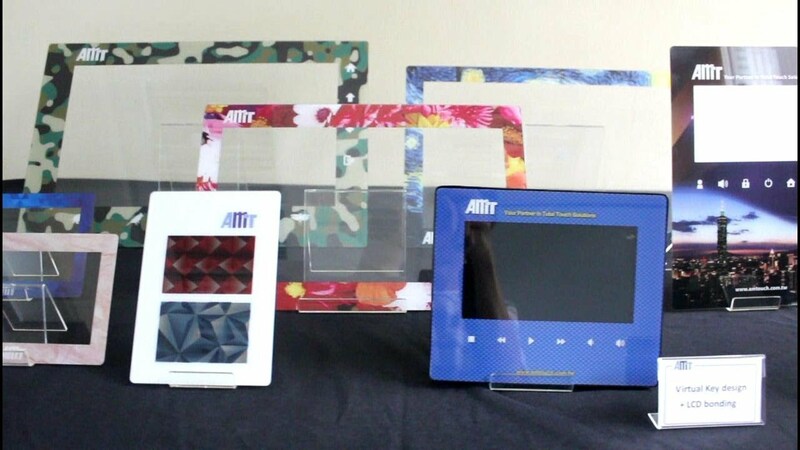 AMT PhotoReal décor glass has passed adhesion cross-cut testing, immersion testing in numerous corrosive materials and solvents, and ASTM 154 Cycle 1 UV testing for 500 hours. AMT PhotoReal décor glass will not peel, yellow, fade, or crack. Imagine the Future AMT prioritizes the accuracy of customer’s graphics. We employ ICC and CMS to ensure the most precise color-matching. Currently, PhotoReal décor glass is available for touch panels from 3”-32”. Metallic colors are in development. Since this type of ink is a conductor, AMT must develop new treatment process to overcome any interference.